All those things you say you want to do. The list can be long, long, long. I tend to have motivation come in spurts. I'll feel exceptionally creative or motivated to accomplish something. Pieces will be collected and I'll get ready and bam. The motivation fades as quickly as it come. I've been dealing with some issues with RA which I didn't realize were RA issues. I knew depression was a side effect of this. You gradually lose mobility and that can be very depressing. I can tell myself, repeatedly, to find gratitude in every day, but I often have to face the reality that I just cannot; that this gloomy mood is what I have. I find acknowledging the mood; feeding it even; works for me to slowly leave it behind. In the interim, I don't do much of anything. That can feed my sense of worthlessness. "If only I felt better, this project would be done." Enter spring. It's hard for me not to feel a tug toward positivity when the crocus bloom and the sky turns blue and the winter coat goes in the closet for a good two weeks before being needed. I feel I can conquer things. I feel I can take those steps I've longed for to make my surroundings happier. That's necessary for my overall well-being. "Time to fix this," I think. Many times that enthusiasm, however, crashes headlong into the reality that I get tired more easily. Still, here we go with the rebirth of the grass in the back yard and the cacophony of birds in the trees. Target didn't help diminish that exuberance. In one of my news feeds; ironically, a business feed; there was a discussion about their new Pillowfort line. Targeted to kids, it's gender neutral and features things without designations for boy or girl. It's part of Target's stated objective to make as much of their kids things for all kids, inclusive, rather than blue for boy and pink for girl. You can still find those things but girls like trucks and boys like dolls. Kids shouldn't be pigeonholed into colors and items because of their gender. I can't agree with this enough. 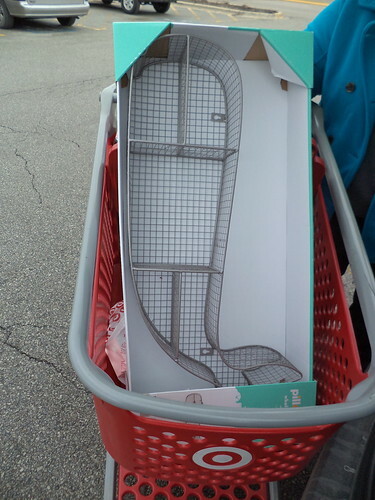 The article showed some items from the collection and one of them was a shelf unit. It's a whale! I read dimensions but I can't always get my head around sizes relative to anything else. I could order it online and pick it up at my local Target. As I had to get a few other things there, this was a score. It's big. It's going to go on the wall opposite the medicine chest and sink. 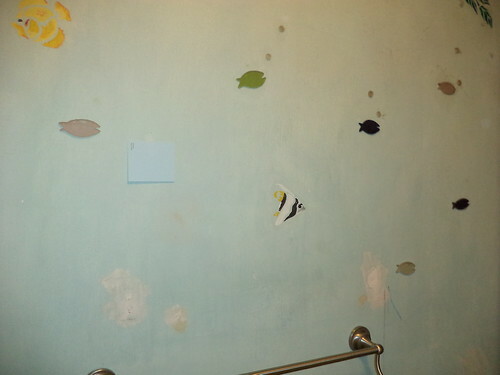 When I held it up to the wall, the sadness of the long ago paint scheme in the bathroom was overwhelming. I need a fresh coat of paint on the walls. If I'm going to make this a focal point of the bathroom, I need walls reflective of that. As if they were mind reading, I got a flyer in the mail from Ace Hardware. There is, this weekend as I type, a buy-one, get one free sale on their best paint. Seriously? I would need painting accouterments as I tossed all that stuff last year, when I was cleaning in the basement for the new washer, because the stuff was old. But cutting the big cost, the paint, in half, could motivate me to actually do this. When I went to get garbage stickers, I asked about the smell. That could be a deal breaker. 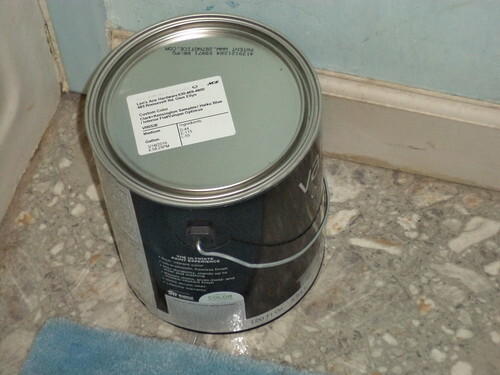 The smell, the volatile organic compounds, released as paint dries, are not good for people with breathing difficulties. I don't want my house to make me any sicker than it possibly is. If I have to wait until June, when I throw open the windows, would the paint have settled out? The good news is the sale paint is low VOC, suitable for pregnant women to paint walls with and it is guaranteed to not settle out for up to 9 months after being initially mixed. I grabbed some swatches and stuck them on the wall. There is light blue tile in the tub/shower. I have a nautical theme in the bathroom which is why the whale shelf appealed to me. It's important to match, as close as I can, the tile. 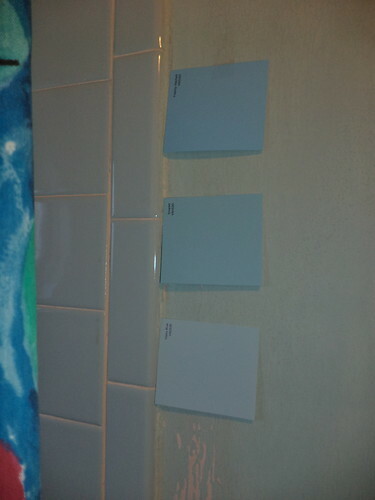 Ideally, you take a tile piece with you and they match it, but I have no idea where the extra tile is that I had. So, I picked what I thought might be close or complimentary. While I was there, I thought about the neglected back door area. I was going to paint that yellow to compliment the minion poster hanging there. If this is a buy one get one, what if I actually bought the yellow for the back? 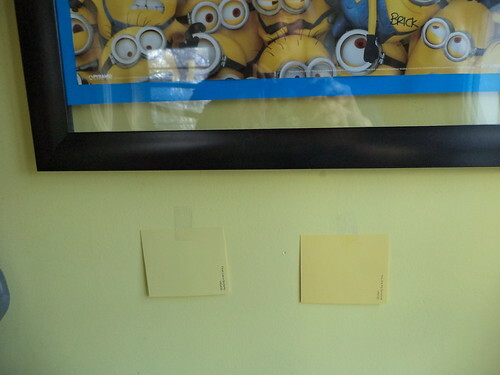 I grabbed some yellow swatches and slapped them on the wall by the poster. I wound up going with the bottom blue and the left yellow. In my head, I thought a light lemon yellow would make the poster "pop" on the wall. But the light lemon they had seemed too light, washed out. Hence, I've gone with a color that is an exact match to the one there. Funny how that works out. Here we are, the end of March. I have two brand new cans of paint in my house. One sits on the kitchen table and the other sits on the bathroom floor. I'm going to paint the baseboards and the trim around the door this blue. It will be immersion, which is why having a light color on the wall will work. The ceiling will be a bright white, when I get that far. Right now, I have to get the counted cross-stitch project done and I have a few days upcoming when I can just sit and stitch. I also have to prepare the wall for painting. Gone will be the fish stencils and those solid color fish "stickers". They are a gel plastic. I forget how old they are. Carole was living at home when we found them somewhere and thought they would be cool. They have been, but, over the years, they have attracted and held dust and dirt. I just didn't have the gumption to pry them off the wall and repaint. I'll have to take the towel rack off the wall. I don't relish that. My fear is that I won't get it back up. In my mind's eye, I picture doing this wall, then resting. Next would be the wall by the door and a rest. Then the wall by the sink and stool and ending with the bit of wall above the shower. It's a month-long project or, if I take a week off work, a full week's painting. The same thing goes for the back door area. A wall a week and it's done. So, with the advent of spring, this is what inspiration looks like. Supposedly, this paint can be written on with chalk. If so, that could provide some artistic avenues in a nautical bathroom. Or I could buy this or this. Maybe the fact that I have cans of paint will keep me motivated to get this done. These are awfully expensive paperweights. Sounds like you will be really busy during Spring. 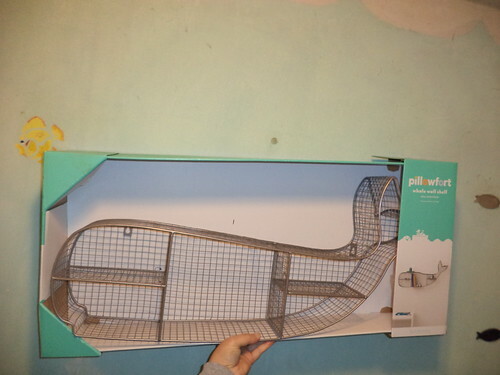 I like the whale shelf.